Why is BEMER® so effective for all conditions, diseases, sports and health maintenance? The human body is an incredible multi-cellular organism comprising billions of cells. Every single cell performs an average of 4 million chemical reactions per second. Cells require a consistent supply of oxygen and nutrients so that they can perform their life-giving metabolic functions. The delivery system for oxygen and nutrients is the blood circulation system. The vast network of the smallest blood vessels (capillaries) is called the microcirculation. The microcirculation comprises 74% of the entire blood circulation system. The capillaries are critical for the efficient transfer of oxygen, nutrients and metabolic waste between cells and blood. Where you find impaired microcirculation you will find cellular dysfunction. When a large enough number of the same cell types dysfunction you will find symptoms of disease. BEMER® has been scientifically proven to enhance specific microcirculation parameters ensuring that the cells of your body receive the oxygen and nutrients they need to metabolise correctly. BEMER® will give your body the best chance to heal itself and encourage it to stay healthy. 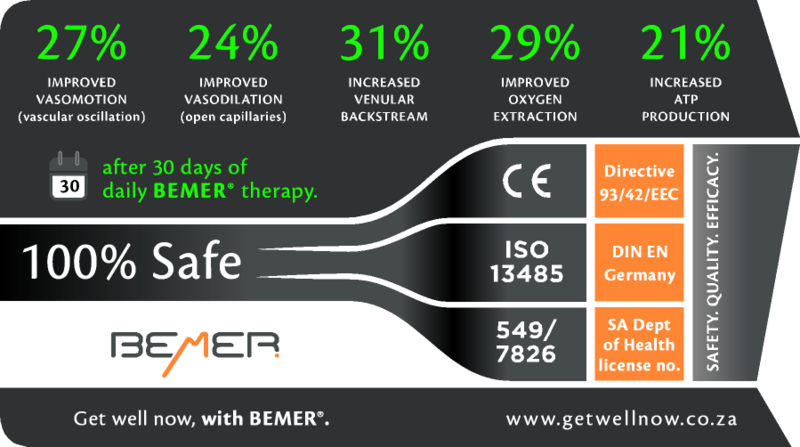 BEMER® is 100% safe and can be used daily with total confidence regardless of your age or your health status. Your road to Optimum Health starts with BEMER®. to monitor your progress when you purchase a new BEMER® Classic System or BEMER® Professional System through Get Well Now. Terms and conditions apply. Call us for a private or group demonstration, and get well now with BEMER®. An official BEMER® Partner in Southern Africa since 2004.